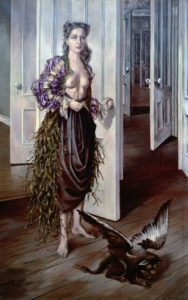 Dorothea Tanning (1910 – 2012) was an interesting character. She was good-looking with an attractive personality and a sense of humour. Brought up in an uninspiring small town in Illinois, she gravitated to the artistic world of New York where she painted while supporting herself as a commercial artist producing advertising material for businesses such as Macy’s. In 1946, she met and married the German surrealist artist, Max Ernst, as his fourth wife. Tanning had already discovered surrealism and her early work was very much of that movement – unnerving and illogical scenes mixing dreams and reality. The exhibition includes a number of well-known paintings of this type by her such as Birthday and The Guest Room. In the first, a bare-breasted Tanning stands beside a series of open doors in a skirt hung with little figures and a winged creature at her feet. In the second a naked young girl and a strange creature stand in front of drawn curtains which reveal a child and what appears to be an older person in bed together with a hooded figure standing over them – slightly reminiscent of Michael Jackson at the current time. In the later Maternity, a mother holding a baby and with a dog with a human face at her feet stares out over a desert in which there stands an open door with just its frame. While Tanning is an accomplished painter, these surrealist works seem somewhat contrived and to lack impact. An exception is Family Portrait which is striking with a ghostly father figure looming over a table at which a confident young woman sits and below which is the smaller figure of a harassed mother. Tanning moved on from surrealism to painting large abstracts in which parts of human anatomy can be glimpsed. She was rather addicted to high-flown language (‘the decibels of nature can crush an artist’s brain’) and many of these works have French titles such as Insomnies. In fairness, though, she and Ernst were shuttling between France and the US at this period. The intention was apparently that these abstracts should be like kaleidoscopes revealing more, the more you look at them. I may have not looked for long enough but I could not find much to latch onto in them. More appealing are costume and set designs Tanning produced for the ballets of Balanchine and John Cranko. These are striking and confident and one wonders whether they built on her experience as a commercial artist. In the 1960’s, Tanning stopped painting for a few years and devoted herself to creating fabric sculptures. Hôtel du Pavot, Chambre 202 is an installation consisting of a claustrophobic and surreal room in which there are some of her anthropomorphic fabric sculptures with others bursting through the walls. ‘Pavot’ means ‘poppy’ in French with its implication of opium and hallucinations. Room 202 is apparently a reference to a song about the suicide of a gangster’s wife in a Chicago hotel which includes the lines ‘ In room two hundred and two / The walls keep talkin’ to you’. It is an effective work. Tanning moved back to New York from France after the death of Ernst in 1976. She survived him for more than 30 years, dying at the age of 101. In her final years, while continuing to paint, she took up writing poetry and had several collections of her poems published. The exhibition does justice to Tanning’s long and varied career. She was clearly an interesting and talented artist, although probably not one of the first rank.